Summer, 1976 is a new chamber music composition for tenor and string quartet by composer Kim Sherman set to original poetry by Daniel Neer that illustrates the summer of a 10-year old boy in rural Ohio during a celebratory and troubled time in American history. Divided into four movements that correlate to the summer months, June, July, August and September, and inspired by the metamorphic changes in a butterfly’s lifecycle, Summer, 1976 strives to portray the idyllic coming-of-age of a young boy in sharp contrast to the troubled world that lies just outside the farmlands of Ohio. 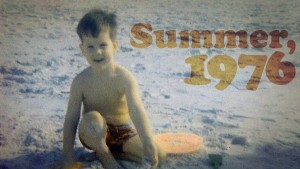 The goal of Summer, 1976 is to create a musical landscape and dramatic storytelling device, through the medium of chamber music, that captures the bittersweet portrait of a young boy preparing to take on the world. The poetry will be adapted to tenor voice, who in a semi-autobiographical manner is reflecting on his youth, while the strings take on the multi-dimensional task of fleeting from emotion to another, fitting the boys whim, while also foreshadowing the turbulent road through adolesence and finally the harsh wintry travails that come with adulthood.